On 9 September 1939, Canada declared war on Germany. Our nation was in a more sombre mood than at the beginning of the First World War. This time, Canadians, hardened by both the earlier conflict and the Great Depression, had a more realistic view of what they faced. They knew that the cost, both in terms of human life and the country's financial resources, would inevitably be enormous. Nevertheless, the majority were resigned to do whatever it took to defend Canada from an enemy that seemed to be overpowering, one that represented totalitarian values that were the opposite to those cherished in Canada. The existence of our nation, of our allies, and most importantly, of Great Britain, was in mortal danger. National Archives of Canada (PA-115198). Private W.E. Dexter Attends to Wounded Medical Officer, Captain A.W. Hardy, Santa Cristina, Italy, September 1943. As in the First World War, Canadian soldiers made the supreme sacrifice by giving their lives in defence of their pals, their regiments, their country, and the ideals of democracy, peace, and freedom. Whether serving at Dieppe or Juno Beach in Northern France, Ortona or Monte Cassino in Italy, or Hong Kong in the Far East, Canadians endured the grim realities of modern warfare. Thousands of soldiers met the same tragic fate as the men shown here. National Archives of Canada (PA-116852). Personnel of "B" Company, The Loyal Edmonton Regiment, Advancing through Ortona, Italy, 21 December 1943.. The Second World War was truly a "just war." 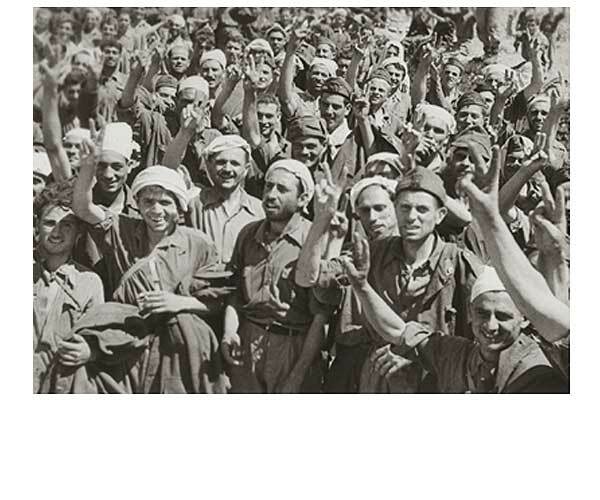 The Allies participated in the conflict for the very noble objectives of halting fascist aggression and freeing the occupied territories of the world. 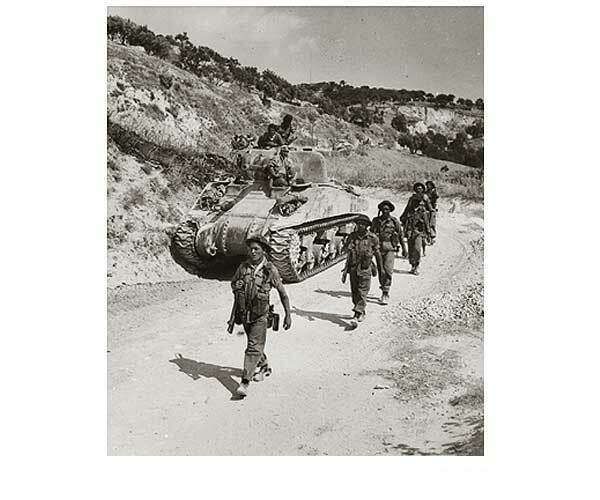 The Battle of Ortona, depicted here, symbolizes this struggle against tyranny and oppression. With the Allies, and at the cost of many casualties, the Canadians helped liberate Europe and restore freedom. National Archives of Canada (PA-114811). Canadian and British Prisoners of War Awaiting Liberation, Hong Kong, 30 August 1945. Along with wounds, battle fatigue, and the ultimate cost of war, death, some troops suffered through long months in prisoner-of-war camps. While some prisoners of war (POWs) were treated fairly, many captured Canadians had to endure intolerable living conditions. Some soldiers, such as the ones photographed here, were faced with the ordeal of surviving a Japanese POW camp. Canada's contribution to the Second World War would be a remarkable achievement for a relatively small nation. A total of 1,136,999 soldiers, sailors, airmen and airwomen, served in the armed forces. Of these, 32,714 would be killed in action; 9,329 would die of other causes; and 54,414 would be injured; 8,995 would spend some time in a prisoner of war camp. All would sacrifice time from their families and years of income, neither of which could ever be recovered. Most would also be compelled to cope with the stress of battle and the death of comrades-in-arms who had become friends. Later, after the defeat of Germany, the overwhelming evidence that the Nazis had promoted mass murder and oppression revealed just how terrible an enemy Canada and its Allies had faced. The horrors of the Holocaust made all Canadians re-examine themselves and the way that Canada treated its own citizens. In the end, our nation would come out of the war with an even greater commitment to justice and to the protection of minority rights. Canadian Soldiers Walk Alongside Tank. 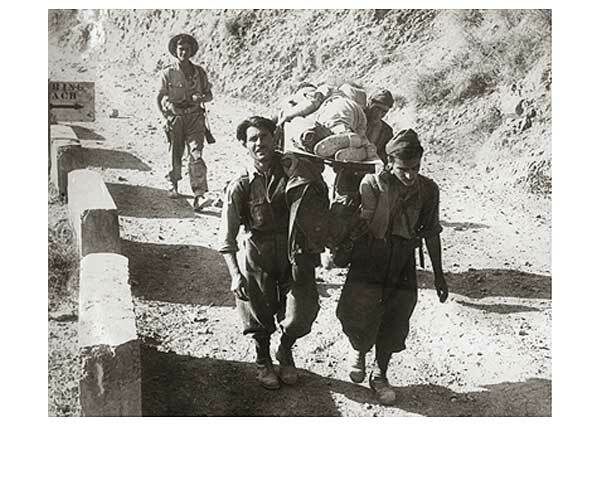 Italian Prisoners of War Carrying Wounded Soldier. Canadians March over Uneven Ground. 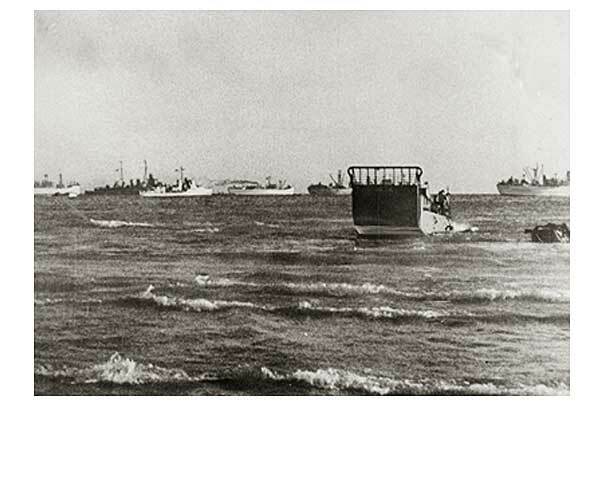 Landing Craft Plows Toward Shore. Clears the Way for Invasion Force. City of Edmonton Archives (Loyal Edmonton Regiment Collection, A96-215, Box 8). 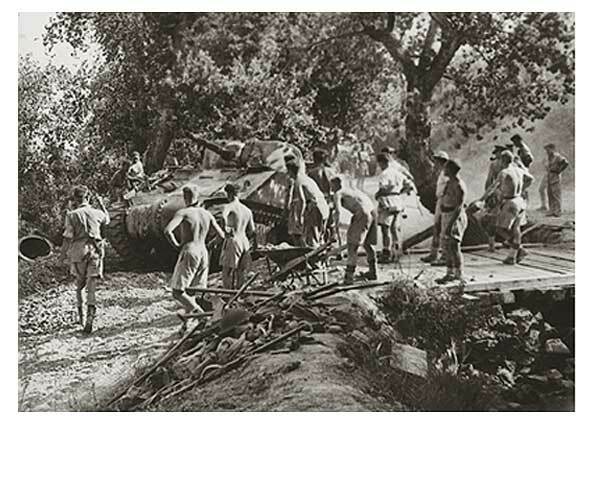 Canadian Troops Invade Sicily, July 1943. 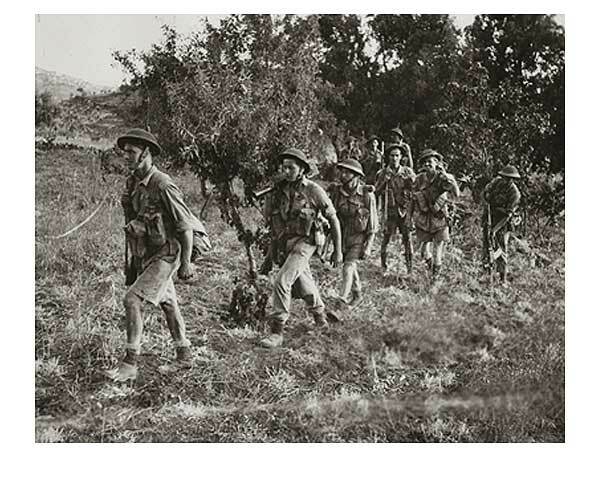 After Hong Kong and Dieppe, Canadian soldiers experienced their next major ground engagement in Sicily. 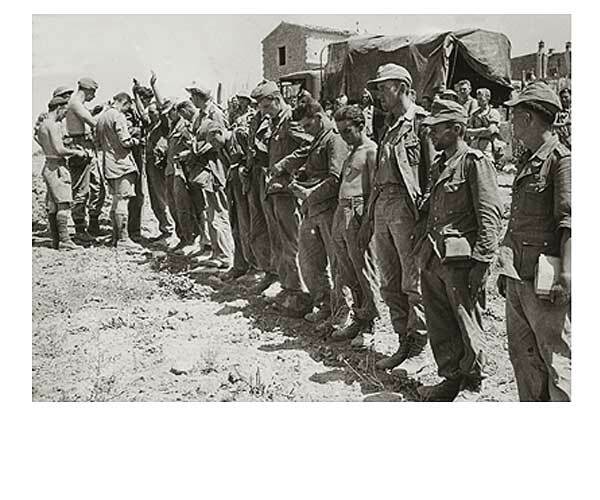 While the campaign was ultimately a triumph, the Canadians suffered over 2,300 wounded, captured, and dead in Sicily. If the First World War helped to turn Canada from a colony into a nation, the Second World War moved Canada onto the world stage. 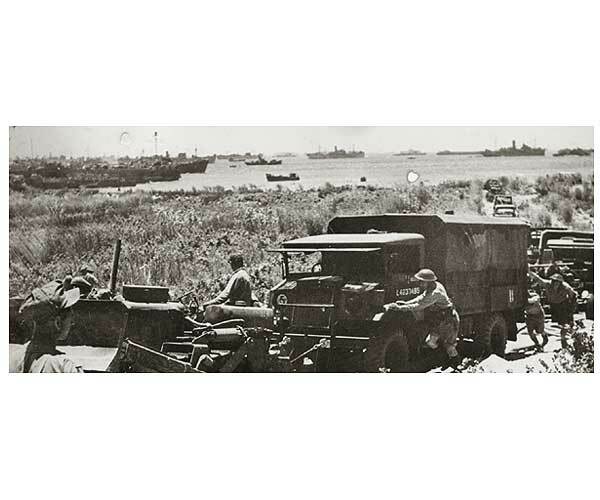 Canada's enormous contribution of manpower, money, and war material, and its potential contribution to reconstruction, meant that it had to be taken seriously in the planning for the post-war world. Once again, the sacrifices of Canadian soldiers had helped to transform the country.